Former NBA and ABA player, and two time National Champion with the UCLA Bruins, Swen Nater was kind enough to join the program. Swen and I talked some NBA Finals and he still thinks the Warriors will win the series. Swen was also kind enough to talk about his journey to play professional basketball. He shares some very personal details about his life and hope you all appreciate it as I do. 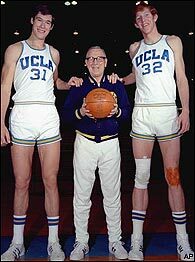 Swen is pictured here with Coach John Wooden and Bill Walton. I apologize in advance for the sound, Swen’s voice is a bit muffled at times. I hope you enjoy this as much as I did recording it.